Sparkling turquoise seas, perfect weather and pristine beaches help make Koh Samui’s one of Thailand’s favourite holiday destinations. Half the size of Phuket, the island of Koh Samui is easily driven around in a day and beneath the gloss of its picture-perfect seaside resorts you’ll discover a unique character and plenty to do. Thailand wouldn’t be Thailand without its magnificent beaches and one thing is for sure – going barefoot on white sands washed by clear tropical waters and fringed by palm trees will be part and parcel of your holiday. Whether your beach of choice is an unspoilt, secluded haven away from the crowds or a busier version crammed with water sports, bars, restaurants and shops, Koh Samui offers plenty of choice. Chaweng Beach is the longest and most popular with its powdery soft sand and crystalline waters awash with boats and bathers. And, if you’re looking for a party scene, Chaweng is the right place with its multitude of music bars, restaurants and shops plus a bustling social scene, day and night. For a little break from all the commotion, make your way to the southern end of the beach with its stunning views across the hilly headland. Just south of Chaweng, Lamai Beach, Koh Samui’s second most popular, is somewhat quieter and smaller than Chaweng. Just inland lies a tropical wonderland of coconut groves and banana plantations. If it’s not too hot, take a walk or cycle ride following the headland to the Grandfather and Grandmother Rocks which are favoured picnic spots. If you want shops and nightlife, there are plenty here too along the main streets and lanes adjoining the beach. 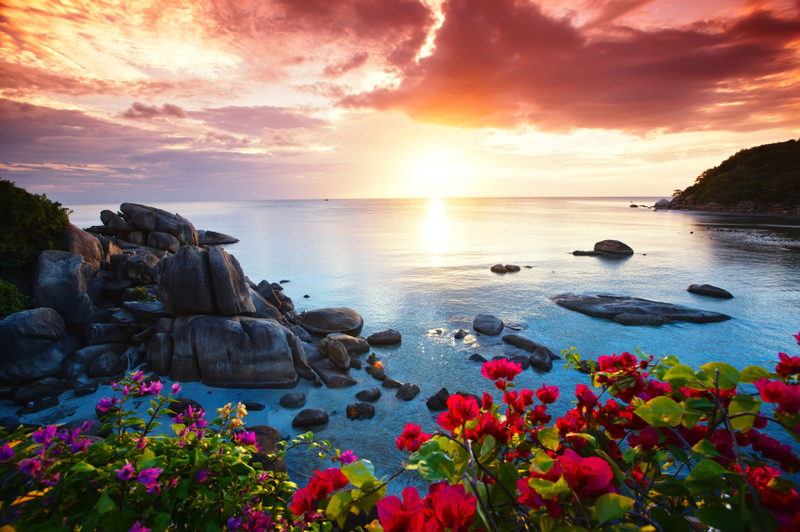 The north coast of Koh Samui hosts quieter, more secluded beaches than on the east coast. Bophut is little more than a fishing village but its main attraction is its magnificent 2 kilometre stretch of secluded white sandy beach. Big Buddha Beach is famed for its imposing 12 metre high Buddha statue along with its charming, small restaurants serving authentic Thai food. For exclusive resorts, try Choeng Mon Beach and the surrounding area with its collection of small, scenic coves. Another fantastic facet of Thailand is its abundance of excellent spas, perfect for the ultimate in pampering. Koh Samui has always been a magnet for anyone wishing to relax and recharge both body and mind. They have now become hugely popular on the island and often lie at the heart of some of the island’s most exclusive hotels. Favourite treatments are Asian beauty treatments, traditional massage plus all manner of de-stressing body treatments. If you are looking for the most authentic Thai spa experience, you could partake in a spot of liver fasting or meditation; alternatively try some herbal treatments or steam caves, many of which are seamlessly incorporated into nature within idyllic surroundings. For such a small island, it’s well geared up for entertainment, luxury and fun so if you’re not simply relaxing by the pool or on a beautiful beach, you might like to kayak at Angthong Marine Park and discover its caves, lagoons and beaches, or perhaps enjoy a spot of fishing or snorkelling at Coral Island. Trekking takes you through the jungle to Samui’s most famous waterfall, Namuang 1, where you can take a refreshing dip. Thai kick boxing is not for the faint-hearted but the country’s national sport is a constant source of fascination, right from the initial ritual dance to the boxing itself which is widely considered to be one of the most lethal sports in the world. Not for the feint-hearted and quite unlike western-style boxing, going to see a Muay Thai match is an experience. Over the past few years, Muay Thai has spread globally as a popular sport and hobby and Samui boasts some well-maintained gyms. If you would like to learn some Thai kick boxing moves, try Jun Muay Thai Camp, Wech Pinyo Muay Thai or Superpro Lamai Muay Thai Camp, all at Lamai Beach.